Can Obama turn rhetoric into action on climate change? 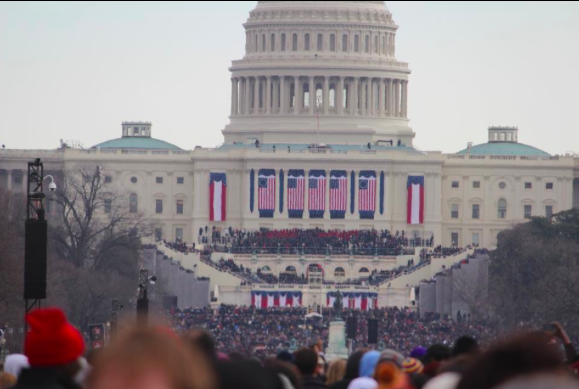 I just stood in the cold on the National Mall in Washington D.C. along with 600,000 people to listen to Barack Obama’s inauguration speech. Factions of the media have analyzed it as a very “progressive” or “liberal” speech. I didn’t take that away from it. For me it was a very American speech. It was full of references to Dr Martin Luther King, the founding fathers, 1776, the Constitution, the military, the greatness of America. It was clearly a fairly liberal crowd surrounding me, but Obama was tugging the heart strings of all Americans with his words. It also, refreshingly, paid tribute to science and technology and urged America to harness both to reclaim the country’s position as a leader in innovation. There’s a dark hint in that first sentence that the US feels its technological lead has been wrested from it by illegitimate means. Its attempts to tighten up intellectual property law, its distrust of Chinese technology giants like Huawei, are testament to that partly justified paranoia. But before it came something more fundamental and universal on an issue that got hardly any play during the election campaign. The overwhelming judgement of science. I haven’t listened to many inauguration speeches but I doubt such a strong statement about science has ever been made by a President on such an occasion. Now the reality bites. As the fiscal cliff negotiations illustrated, US politics is more partisan than it has been in a long time. The economy is not growing, America is spending beyond its means. Many will be asking what Obama is going to do in the next four years about these immediate problems. Climate change mitigation doesn’t enter those discussions, it is considered a cost, a nice to have, something we can do when they lower the deficit, return the economy to a path of growth, return the US to a position of hegemony in the world. Obama’s challenge, and if he can rise to it, he deserves another Nobel, is to change the thinking so that the issue of tackling climate change is central to all of the above. He is jubilant at this moment, he has avoided becoming a one-term president, his place in history is secure. But the real judgement of him will be measured by what he does in the next four years, where he has a mandate to pursue the agenda he laid out in the election campaign. With several precious moments of his inauguration speech devoted to science, technology and the effort to mitigate climate change, there’s a strong hint he will pursue the issues in this space that were left on the table in his first term. I hadn’t quite appreciated that the quotes above came from the same para in the speech, but with 2nd being followed by the 3rd and then the 1st in the actual speech. Read in that order you can see that he’s also playing to the rationalists (those that sign up to the “judgement” of science) and then to the religious. (“commanded to our care by God”). This is pure politics, nothing to do with science, or rather a misuse of science for political ends. The idea that science makes the judgements, rather than politicians, should on a science blog at least be a matter for critical analysis, particularly since it essential implies a new scientific method. Similarly the dog whistle “Some may still deny” should be seen for what it is, party politics, as is the shift from “renewable” energy to “sustainable”, which is code to give comfort for the other wing of the target audience. All told not “a strong statement about science”, more business as usual at the White House. Nice, thoughtful post, Peter – thank you. Obama’s rhetoric can still deliver hope for a better future.